Tak bisa dibiarkan, ujar penguasa kota. Stop mereka! Poetry by Akhudiat above gives a more realistic perspective about Surabaya. It is a factual poetry that strikes through, not such a pretty poetry that Rendra used to write about wine and moon (just showing the beauty kind of things, without much consideration of social reality). In a city construction and development, there are always those who “lost” and “defeated” which then has becoming “thorn in the flesh” in the progress of the city itself. It is clear to see though, that this city has not been a city for everyone, for any kind of social groups. Only for the upper-class and some of elite-social groups who can enjoy this city. Meanwhile, for the lower-class, they are only becoming audiences. Moreover, they are usually considered as a “burden” which then must be isolated, removed, uprooted and discarded. It would not be wrong to call them as “the periphery” because it is actually on the edge; if not careful enough, they might get thrown away into the abyss. Basically, a city must be built with rules or regulations (also with law constitution), but the rules usually take sides to the strong groups and also full of the benefit from various parties. We need a city which not only is built with strict rules, but also a city which is built with a heart, one that humanizes humans, sharpens the senses and brings up the empathy. In this case, we do not have to go too far to look for the root of “human’s relationship” from other places. The culture of “Arek” which can be regarded as the “authentic” culture of Surabaya, which prioritize the solidarity, being outspoken, act as it is (being honest, nothing to cover up) could be a great culture resources. This kind of culture shall have becoming a turning point for humanist creativity of Surabaya. A city which is more friendly and warm, and among its citizens would take care of each other, give each other attention. Surabaya is known in the whole Indonesia as the City of Heroes, as a reminder of the courage that arek-arek Suroboyo had against the British troops who came along with NICA in November 1945, never considering to surrender even they were being attacked from the land, sea and air. Yet, the term Surabaya the City of Heroes after a while lost its meaning, becoming a mere jargon, repeatedly proclaimed (without going through the heart or soul). It is a word which is repeated too often being and then it loses its meaning. Like a cane that has been squeezed out of its quintessence and left the dregs alone, or like a flower that has being absorbed its honey-juice and wither. If you see Surabaya closely enough, you can ask yourself: What makes it so special? What is the mainstay? What is the benefit? Then, try to compare with other cities in Indonesia (or in the world), is it not nearly the same? Yes, almost no difference. There are traffic jam, flooding issues, beggars, illegal immigrant, many crimes, accidents, evictions and etc. There are also art community, hobby community, car free day, mall and plaza, shop-houses in a row, new streets, and also government buildings. So, what is the difference? Well, if there are any differences, so why are we proud of it? Why do we glorify it? It is a pride which is logically confusing. Yes, it is an unclear and an absurd pride. The heroism has become only a ritual to be celebrated on November 10th, without ever being contextualized. Where is the hero of our era? It seems, if there are (or will be) any heroes that come up, they would be beat up by the thugs who live in our city. Tralala! Still related with the previous fragment. In a word “pahlawan”, there is a word “lawan”, perhaps it is also interesting to be discussed. Surabaya became a city of being opposed and also of being opposing forces. In a perspective of creative city in Indonesia, our position is still considered as underdog, tend not to be considered “kereatif”. We are the periphery. If we just sit down and not fight, we are going to be on the edge then we fall off into the drain. Oh my got! When I met an entrepreneur from Surabaya who had the chance to observe this city, he said that Surabaya is a city that does not (yet) have any characters. It does not have any internal powers that can be revealed as a meaningful and a typical expression. Want to be called as a maritime city? The sea is quite unorganized. Want to be called as a culture city? We cannot beat Jogja, obviously. Want to be a creative city? We have to step over Bandung first. Then what do we have to do, cak? We do have flaws in searching for characters. Not so much different in education or in football games, we are trying to make a synthesis but all we have got is the synthesis of confusion. Our educational system is disoriented whether to imitate Europe or America and so does the football games, including Surabaya, is also the same. Is the future of Surabaya going to be in Jakarta, Singapore or Hong Kong? Something with a strong character never comes from the outside and cannot be forced from the outside either. It emerges from the inside and is being built and developed from within. That is what we may not be fully aware of. If on the bible, it has been said that God is closer to us than our neck veins, and then actually the secret of Surabaya is also located on our neck veins, Surabaya people. We are too short-sighted, we can see a small thing across the ocean but a big thing right in front of us called Surabaya is invisible. Is not that weird? Every city always has an utopia, an ideal ambition which considers what could bring its citizen to the better future. A utopia can be a vision, a purpose which is usually make by persons who in charge to command and control the city. In fact, what is happening for real is heterotopia(s), there are so many kinds of dreams about Surabaya. Surabaya is not just one big room, but there are so many big and small rooms which have different directions and orientations. Let every citizens define theirs. Do not ever dictate them, moreover never indoctrinate them. We are still accustomed to the top-down policy, from the top to the bottom. We need to develop the bottom-up policy, from the bottom to the top which comes from the buried feelings of people in the periphery area, from the public transportation drivers or pedicab drivers, even from the street vendors who have to experience any evictions. Thus, we would have many dreams about the city; whether it is the good one, the weird one, the insane one and even the insanely disgusting one. All of it could become the celebration about dreams that (might) enlightening. 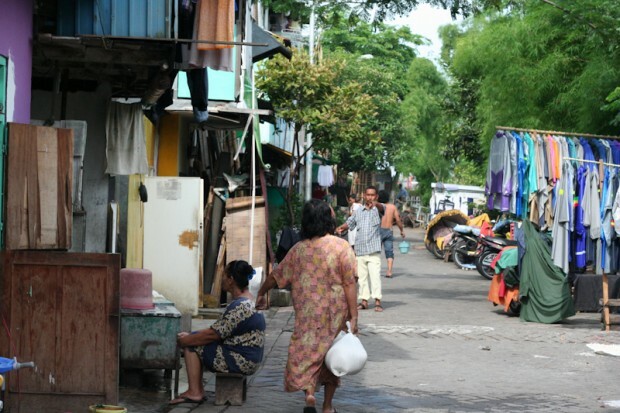 Surabaya is not a totalitarian city but a democratic city. The holders of power is the citizens, not the mayor or even the heads of sub district. Citizens are human too, they are not robots who can be directed to where they should move. By daydreaming, is it really necessary that we need to be mobilized? Sometimes we need some breakthrough: as an example, there will be a day where any pedicab drivers can roam around the city, or give a night for street vendors so that they can peddle their stuffs anywhere or make a new curriculum about the trip of the elementary students would experience by visiting villages and they have to know the customs and the culture those villages. The creativity that we learned from the west actually made us share similar creativity towards each other, we need a resistance, as if by making an Anti-Creativity. We can learn from Humanism which is in fact cannot be equated in the whole wide world and then there is Anti-Humanism. But then, the Anti-Humanism is more Humanism instead because it more facilitates the status of human being which is the nature is never be even and may not be homogenized. It is such a waste if we learn about the creative people from the West but then we forget about the richness of our own creative people, of our own creativity, forget about the Anti-Creativity. We can learn from the scavengers, the household sellers, the tire builders, the handyman toys and etc. You must have heard less of the sound of household sellers who used to have the old women as his customer because their pan leaked also the sound of “steam engine” from putu seller that buzzed along the street. In the next few years, the sound of household seller and the buzz of putu seller might have gone from Surabaya, where do we go to look for it? Do not worry, those sounds already being preserved in the Sound Museum, Netherlands. Lho? Once again, Surabaya is a city that is continuously growing up and developing. A city is not just a bunch of buildings, a sequence of spaces, a row of houses, a line of malls and plazas, or a crowd of modern market. A city is also a set of human beings who have soul, heart and feelings. So, in creating a city, we have to talk with soul, heart and also feelings. Not just because wants to look great, then ditch the human (like Hitler), not just because wants to get Adipura, then get after other human being (like Nero). Human has ears, eyes and heart, so go talk to them with human language, not with the bulldozer or with the unit of police. Human can be considered as an entity indeed, but a fourth-level entity. So, a city named Surabaya should be a place to live for this fourth-level entity called human. Apparently, it is not an easy way. Thus far, a city is still becoming the place by human to be placed as a first-level entity until the third-level entity. Human is still considered as tools that can be out in the tool box (first-level: only exist), or being consider as a flower that planted on the pot (second-level: only live and grow), or like an animal that is being cared in a cage (third-level: live, grow and have senses). If you take a look on the banks of the river, the edge of the railroad, around the dump, we still can see any human being whose status is still considered as a tool, a plant or an animal. Humans are not just a place to live or need something to eat, but they also need dignity and self-values as human being, the God’s creation which being said as the most precious one. If they said, “being colonized or being free, it just feels the same for us! We still feel suppressed until the seventh generation!”, then what exactly is the kind of city we have been living for today? Translated into English by Gita Artia.